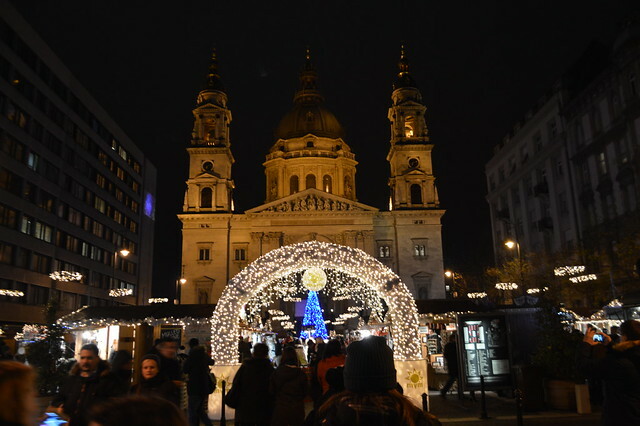 One of the main reasons I visited Budapest was for the Christmas markets. I wanted to visit one on the continent but Germany can be very expensive because they use the Euro there so I settled on Budapest as a cheap alternative. 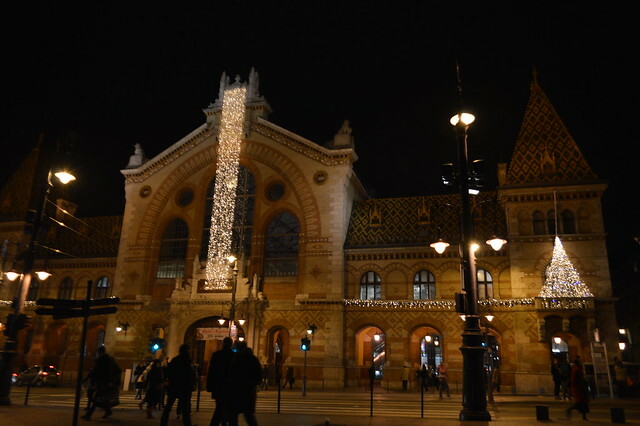 There were plenty of other reasons I visited Budapest including the hot spas and historical sites but the markets were lovely and Budapest it the perfect city for a festive Christmas break. Martyn and I were very lucky because there was a Christmas market right on our doorstep. There is a Christmas Market just outside the Basilica (post about the church here) which was only a two minute walk from our apartment. 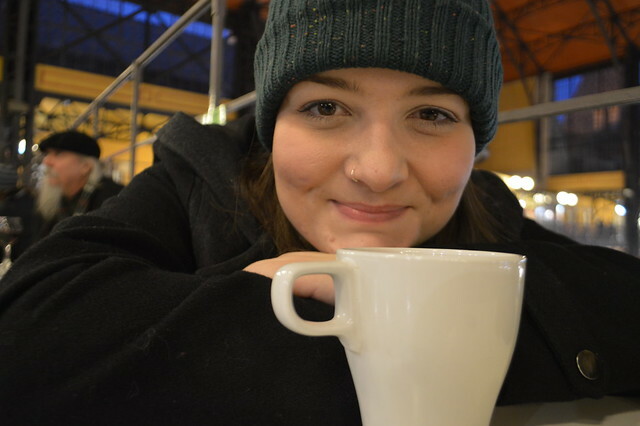 That meant there was a constant supply of mulled wine on my doorstep, we drank a lot of mulled wine so we didn't freeze because it was -2/4 outside for most of our stay. 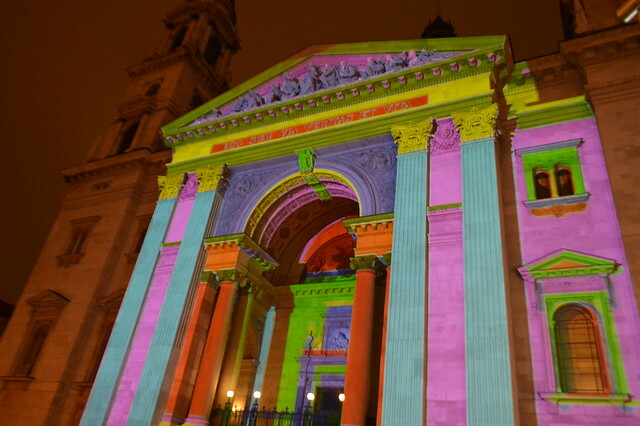 Each hour in the evening the Basilica was lit up with a wonderful light show, some were a bit psychadelic like the photo below. The main market is situated Vörösmarty Square. At the end of November Vörösmarty Square turns into a huge festive market place.Wooden stalls and two outdoor stages take over one of Budapest's most attractive spots during the build up to Christmas. There are lots of handmade good to browse, tasty treats to feast on and a lovely festive atmosphere. 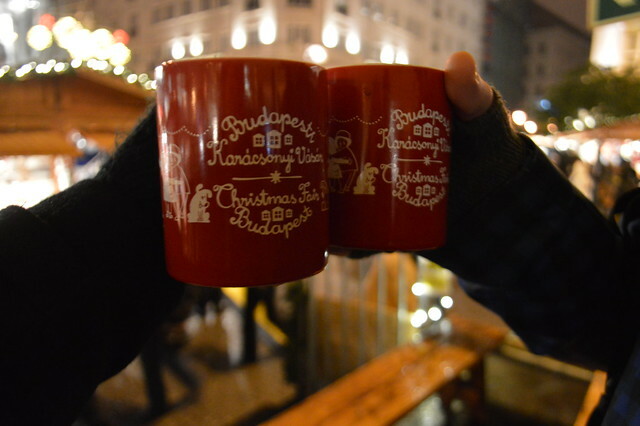 We drank so much mulled wine on our trip, we bought mugs so it would stay hot and took them home with us. I'm sure they were only around £1.50 each too, bargain. Some traditional Chimney cakes at the market. Kürtőskalács (chimney cakes) are made from sweet, yeast dough. 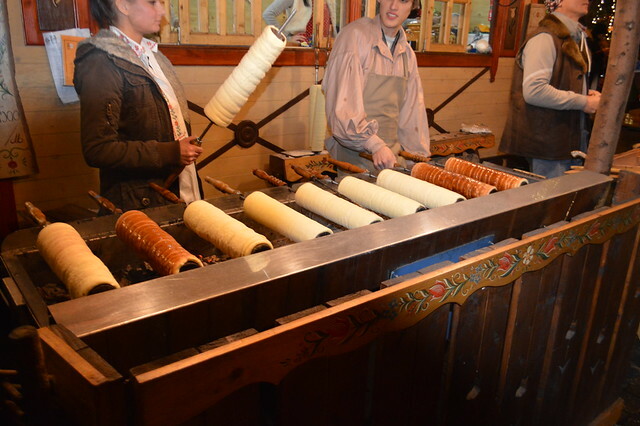 A strip is spun and then wrapped around a cone–shaped baking spit, and rolled in granulated sugar. During the baking process the sugar stuck becomes caramelized and forms shiny, crispy crust on the cake. You can also have additional toppings like ground walnut or cinnamon powder. We also visited the Great Market Hall at the Pest end of Liberty Bridge. It's a great place to stroll even in cold and rainy weather. 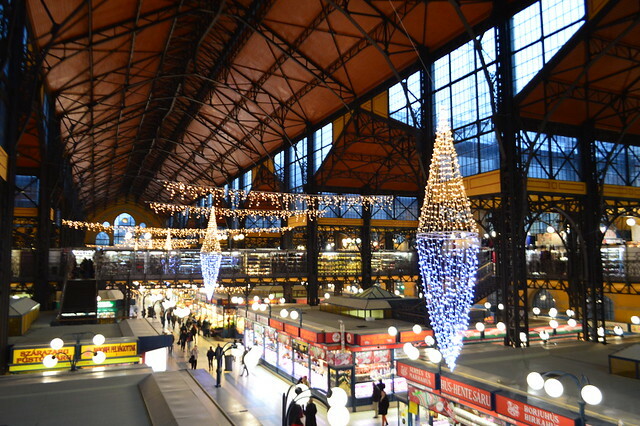 The three-storey hall is huge and you can pick up plenty of Hungarian paprika here. They really know how to do Christmas well in Budapest and I felt that once I got home my festive cheer had disappeared a bit. I was excited to get that Christmassy feeling back when ICE International Currency Exchange challenged me to recreate a Hungarian Christmas. I picked up a lot of souvenirs on my trip and some items in the UK to bring a Central European feel to my home. 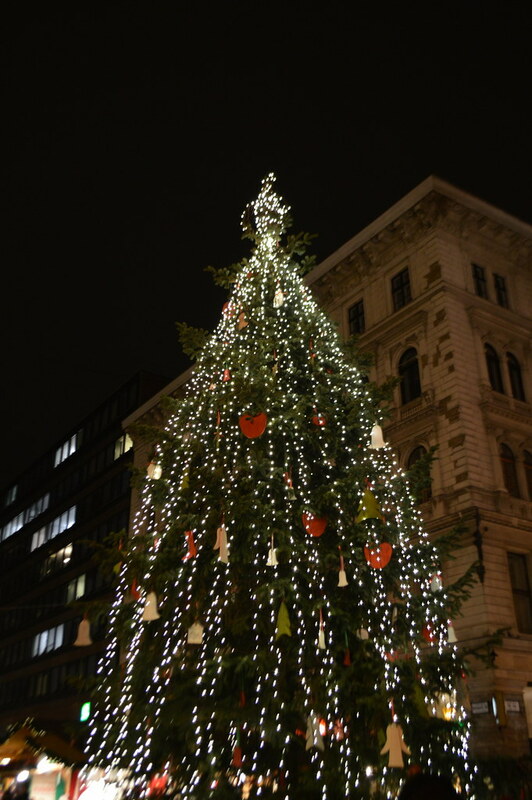 Christmas in Hungary is celebrated with traditions similar to those found in other Central European countries as well customs unique to Hungary. 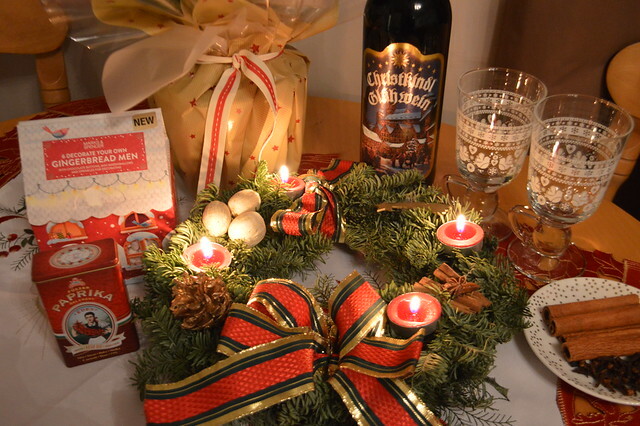 Hungarian Christmas starts with the celebration of Advent. Advent starts four Sundays before Christmas, at this time families decorate their front yards and tables with beautiful advent wreaths adorned with four candles.Every Sunday before Christmas they lit one additional candle and the last one is lit on Christmas Eve. You can find colorful wreaths in every Hungarian home and I saw some giant ones at the Christmas markets dotted around the city. The Christmas and gift-giving season starts early with the Santa-like figure, or Hungarian version of Saint Nicholas, Mikulás (or Szent Miklós) visiting the homes of Hungarian children on the night of 5th December, on the eve of Saint Nicholas Feast Day, 6th December. 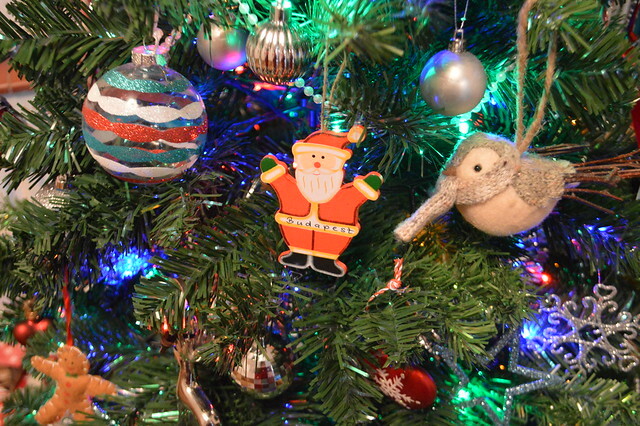 If you're from outside the UK I would love to know how you celebrate Christmas and please share any unusual family traditions you might have, I would really enjoy reading them. Although the role of gift-giver on Christmas Day itself is assigned to the Christ Child, on the night before St. Nicholas Day Hungarian children traditionally place a boot on their windowsill waiting for Mikulás to come by and fill it with treats. In Hungary, Mikulás often comes with an assistant: a "Krampusz", a Devil, who punishes bad children. Before 24th December, people decorate their houses and start to cook and bake. On 24th December, people decorate the tree with ornaments and put the wrapped presents under it. On Christmas Eve young children are waiting for the arrival of Jesus and especially for the presents. Gift-giving is done after the meal, and after singing carols around the tree. 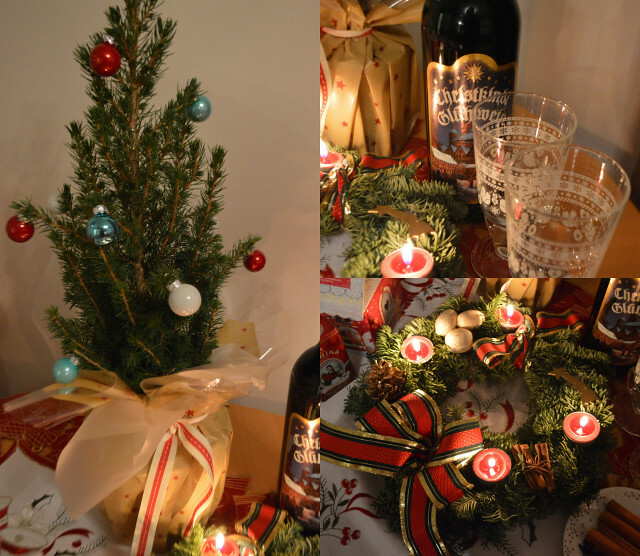 I bought myself a little Christmas tree to decorate today like they do in Hungary, some mulled wine because my trip to Budapest was filled with it, some paprika to make some traditional goulash or fisherman's soup and an advent wreath.